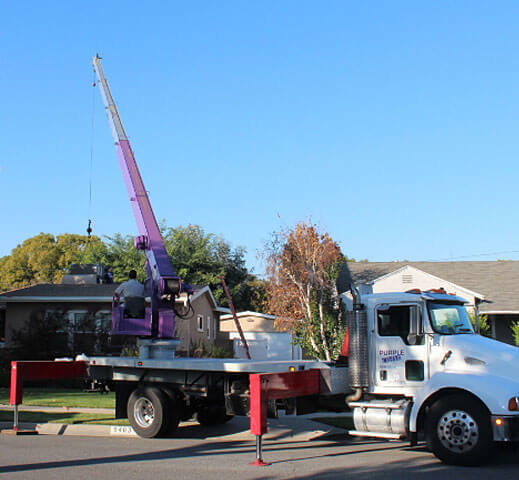 Since 1983, Purple Crane has provided expert, affordable, full-service crane rental for residential projects throughout Southern California. We have cranes ranging from 3-ton to 75-ton capacity, and our 75-ton crane extends to 165 feet. We assist in residential projects requiring lifts of all sizes, including HVAC installation and removal, construction work, and landscaping. We can safely lift building materials, machinery, trees, fountains, and anything else you need, even over houses. If you're replacing your air conditioning unit, we can provide lifting for both the old and new unit, and we'll even haul away your old unit to a certified recycling center at no additional charge. We also have trucks and trailers available for transportation, so we can handle relocation jobs from start to finish: removal, transportation, and installation. In such cases, we provide another crane at the new location to perform the installation and any additional lifting; even for a different construction job or for scrapping. Our services are safe, accurate, cost-effective, and efficient. Purple Crane has performed more than 75,000 lifts over the course of our three decades in business; we have the knowledge and experience necessary to determine the right crane for your job, helping you save time and money and keeping your residential project on track. You can also trust us to safely and efficiently perform your lift: we're OSHA compliant and fully insured, and we can provide same-day certificates of insurance whenever necessary. All of our crane operators are NCCCO (National Commission for the Certification of Crane Operators) certified and have completed thousands of residential lifting jobs. Additionally, they all have years of industry experience, ranging from 9 to 40 years. You can rely on Purple Crane for expert, affordable residential lifting. Call us today; a live person is available 24 hours a day, 7 days a week to answer your call, and our crane services are also available 24/7.